The foundation of a free society is equal worth of all its citizens. The right to self-respect and personal autonomy demands the widest possible spread of opportunities. Not all inequalities are unjust, but unjust inequalities should be reduced and where possible, eliminated. Source: Social Justice Commission (1993) The Justice Gap, IPPR, London. Diversity and equality is something that has always interested me. When I’m leading teams, I am trying my best to deliver a project as part of a team, which I am usually leading as the technical lead. I’m normally reporting into Board level, or one level below, so my projects tend to have high visibility across the organization. My teams are assigned to me, and they are usually made up of people who work full-time for the customer organization. I am mentoring and leading them, while delivering the project. It’s more than that, however; the teams are usually diverse in nature. I enjoy working with diverse teams and I regard it as part and parcel of working in the 21st Century with bright, clever technologists and business people. I always learn something from the people that I work beside, and for that, I am truly blessed. It’s clear that there are general issues around diversity, however. According to the Telegraph (2012), Female execs earn £423,390 less than men over careers. Sometimes diversity means that there are conflicts between what the organization should do because it is right, rather than doing the right thing by the organization. Diversity can also give people messages in the organization that they do not want to hear, because it conflicts with other priorities. Therefore, it’s important to understand the approaches to diversity and see where it really sits in the organization. Where does the conflict arise? 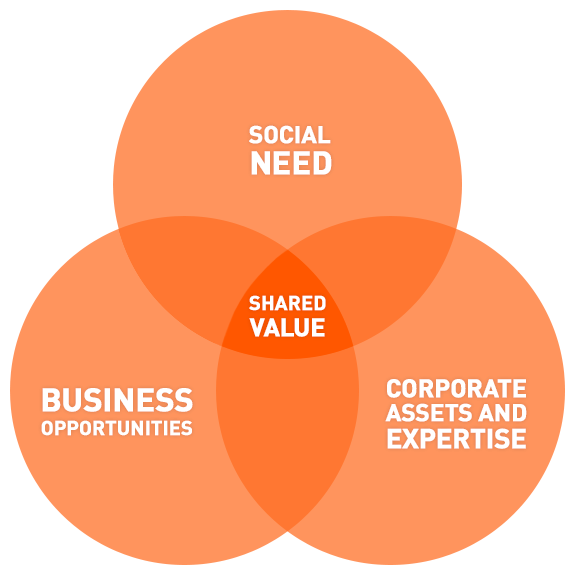 When we look at Porter and Kramer‘s concept of shared value, business activities are recast towards generating economic value in a way that also produces value for society by addressing its challenges. Porter and Kramer tie these things together equally, but what happens if there is a conflict? What happens if a diversity issues bumps up against a marketing issue, for example? Conflicts can manifest themselves in a number of ways. For example, if a complaint is made against a ‘favourite’ colleague, then this can cause a conflict. There are always options, and usually people can try to stay within the law. However, there are other ways of dealing with problems which is often cultural. For example, the leaders can pretend to go through a process of listening to the complainant by extending the process out so that the complainant burns themselves out by complaining about it. An alternative method is to pretend not to understand, and this deliberate misunderstanding can mean that the complainant ends up repeating themselves and burning up energy in the discussions. It’s quite easy for people to expend energy in the wrong places. In the Art of War, one strategy is to decide when to expend your energy and when to conserve energy. For the complainant, they are being asked to expend energy by complaining. For the leaders, the simplest option can simply be doing nothing, but let someone run around burning themselves out so that eventually it becomes a test of patience and stamina, rather than a test of what is right and wrong. When a company makes a decision over diversity issues, they are actively affecting their organizational DNA and making a clear statement to everyone, internal and external, over who they are and what they stand for. I have been part of diversity discussions before, such as panels involving diversity. My inclination is that it is better to take the long view and do the right thing, rather than do the process thing right. Although humans are the apex predator, we ultimately don’t like change but, ultimately, people won’t get a change until they make a change. So, what can we do to encourage and manage diversity in the workplace. How can business leaders work to manage diversity in the workplace? The Equal Opportunities approach holds that people are essentially the same and have similar characteristics, qualifications and talents. Behavioural change is acquired through legislation, which holds positive action rather than a positive discrimination approach. The Equal Opportunities approach is informed by a moral and ethical stance, which focuses on disadvantaged groups of people. There are issues with the Equal Opportunities approach, however. The legislation is weak, and it is reactive rather than proactive in dealing with situations. It may also become out of date very quickly. Fundamentally, however, the Equal Opportunities approach may not change attitudes and beliefs in organisation. This is known as the Empty shell hypothesis where formal policies are simply an insurance against litigation and are not actually put into practice. For example, the policies do not translate into recruitment or monitoring practices within the organisation (Jewson and Mason, 1994). With litigation being the only economic incentive for Equal Opportunities, it remains weak in terms of providing any commercial impetus for the companies and it does not speak to the ‘hearts and minds’ within the organization. The Meritocratic perspective views diversity issues as an incorrect utilization of resources, usually rooted in irrelevant criteria being used for job selection. This can result in a strict formalization of the role. In reality, however, hyper-formalisation’ can lead to disadvantage (Noon, Healy & Forson 2011) as the rules become so rigid, that nobody can pass them. The Diversity Management views any differences as an organisational ‘resource’ which is beneficial to everyone, rather than a ‘problem’ to be handled (Liff, 1997). The Diversity Management perspective does not focus on disadvantaged groups, but focuses on providing and supporting the value of individuals rather than on groups of people. Critics of the Diversity Management approach can see an issue in the ‘upbeat naivety’ of the perspective, which de-emphasises conflicts and problems in implementation (Prasad et al 1997). For some, social groups seen as ‘objective, natural, clear and obvious’ (Litvin, 1997). It is also considered to hide power dimensions of diversity, such as male privilege (Zanoni and Jansens, 2003), due to the fact it can be seen as an umbrella concept designed to reduce conflict (Zanoni and Jansens, 2003). Ultimately, the greatest resource an organization can have is its people. Therefore, managing talent is a key way of enhancing productivity and raising the bottom line. Diversity is a way of opening your lens so that you can attract and retain the best talent, which, ultimately, can help the organization across the board. It can provide you with a competitive advantage, which can bring you closer to the market and perhaps even get to the market first. In accordance with the shared value posited by Porter and Kramer, diversity can even be a way of positioning, enhancing and protecting the brand. If we look at the furore over the recent H & M advert, it’s clear to see how easily brands can be adversely impacted by issues that touch on diversity and race. What can organizations do to consider diversity? Ultimately, there needs to be a culture of respect. The current author has previously tried to open up the idea of a Decency Charter and it seems a pity that Decency has to be incorporated into a culture of an organization. Organizations can also consider holding events such as Black History week and transgender awareness workshops (Noon 2017). For example, the organizations can facilitate networks and groups for social purposes e.g. women only networks; black workers networks, prayer groups. These are just some ideas, and some of these changes are probably quite simple to implement, such as gender / ethnicity balanced interview panels. On a personal note, I have been working to promote STEM subjects for women and I’ll blog about that important topic another day. To summarise, this blog gives a flavour for some of the issues as well as some action points. EHRC (2017) Being Disabled in Britain. Equal Pay Portal (2017) United Kingdom data on the gender pay gap. Franklin, J. (1998) Social policy and social justice, Cambridge Polity Press. Miller, D. (1989) “Equality”, Royal Institute of Philosophy Supplements, vol. 26, pp. 77-98. UK Commission for Employment and Skills (2015) Opportunities and outcomes in education and work: Gender effects. Research briefing November.